The most powerful forms of school improvement aren’t necessarily the most glamorous. If we want to make significant improvements in public education, then our goal shouldn’t be to find a few more superstars. We know that in every profession people tend to be distributed along a bell curve, with the largest group performing somewhere in the middle. That certainly applies to the 3.7 million teachers working in our public schools. So the way to make the biggest difference is to help the largest group of teachers, those in the middle of the pack, to make regular, ongoing progress, so that the whole bell curve shifts. If we were to bump up the average level of teaching performance across the country over a number of years, that would translate to historic gains in student learning. But if our goal is to promote steady progress on a large scale, what does that mean for educational leadership? How do we organize and lead school systems to help our average-performing teachers and staff to get better at their work? I believe, and decades of research findings suggest, that it starts with defining a clear vision for what students need to know and be able to do, and every part of the school system must then be aligned with that goal. Policy: Too often, local leaders think of policy as something to comply with (i.e., state and federal rules to follow) or as a means of responding to a problem (e.g., a code of conduct to stop playground bullying). Yet, the process of defining school and district policies can be both positive and productive. Whether they focus on curriculum, grading, student assignment, equity, or another topic, policy discussions give teachers and administrators the opportunity to clarify what they want their students to learn and what kinds of support those students will require. Curriculum: Strangely enough, throughout the standards and accountability movement (including the push for the Common Core State Standards), policy makers paid little attention to curriculum. But teaching cannot improve without a coherent course of study, materials, and assignments (whether developed by teachers themselves, by the district, or by commercial vendors). District leaders cannot afford to ignore the curriculum while pursuing other priorities — they have an essential role to play, every year, in ensuring the curriculum, standards, and any supporting materials slated for purchase are all in alignment. Professional learning: Teachers often and rightly complain that one-size-fits-all district-mandated training is meaningless. Yet, educators shouldn’t be left to their own devices either, as professional learning must be aligned with the priorities of the school and system, as well as the developmental needs of both teacher and students. Assessment: Schools and systems must cease to be what one former colleague used to call “silos of excellence.” To improve student outcomes, educators have to be transparent about what they do every day and how what they do affects student learning. Data about teacher and student performance (including common assessments based on the curriculum, observations of teacher practice and student behaviors, review of artifacts such as lesson plans and assignments, and perceptual data of both students and teachers) should be used to adjust practice, revise curriculum, and align materials purchases. Accountability: Over the last couple of decades, accountability has come to be thought of as something administrators do to teachers. But in its best form, accountability is reciprocal. Most teachers can make modest improvements if given regular and ongoing supervision, feedback, and support from knowledgeable experts and peers — and from students as well. If leaders want teachers to teach in a new way that will move the district toward its goals, they must give teachers the opportunity to learn and the resources to implement those new approaches. Resource allocation: This year’s PDK poll showed that the American public supports the idea that schools should devote more of their resources to the students with the greatest needs. To do that fairly and effectively, with an eye toward overall goals, leaders require accurate information about what’s actually happening in their classrooms and schools. Politically, it’s always a struggle to reallocate resources (since everyone from parents to the teachers union to the school board has a lot at stake in such decisions), but if the assessment and accountability data are accurate, then it should at least be clear whose needs are and are not being met. Distributed leadership: To promote steady improvement in teaching and learning, one of the most important steps leaders can take is to provide meaningful opportunities for professional advancement within the school or district. Not every teacher wants to become an administrator, but many do want to take on greater and more challenging responsibilities, from informal leadership roles to more formal promotions to positions guiding curriculum, assessment, staff development, and more. It’s not a dramatic, eye-catching initiative, but it is one of the surest ways to improve teachers’ job satisfaction, increase their retention, and push them to keep improving over time in a way that furthers the district’s mission. Community engagement: System leaders must ensure that families, community members, business leaders, politicians, and leaders of social service and faith-based organizations understand what schools are doing to improve teaching and learning. Community engagement can’t be an occasional one-off event; it has to be regular and ongoing, and local educators need to reach out proactively, using whatever media and resources are available. As the PDK poll has shown, the more parents and others feel engaged in the schools, the greater their support for them. School culture: If they want to see steady improvement in all of the areas described above, then system leaders must pay close and constant attention to school culture and climate. It matters how students, families, staff, and faculty feel about their everyday interactions, how they speak to each other in the hallways, and how they get along in times of stress. Schools simply cannot improve unless people trust and respect each other, communicate in mature ways, confront institutional racism and individual bias, and hold each other accountable to shared values and goals. Taken one by one, each of these priorities may seem fairly small and inconsequential. But there is no single big idea that can lead to dramatic improvements in our public schools. Splashy initiatives might attract attention, but the best way to make significant long-term progress in teaching and learning is to get everybody — all parts of the school system — to keep taking small steps in the same direction. That doesn’t make it easy. Any superintendent can tell you how complex and difficult it is to get teachers, staff, parents, and other adults to make even a small change to their customary ways of thinking and behaving, or to agree on how best to tweak school norms, goals, or ways of allocating resources. But if system leaders remain committed to pursuing a clear and comprehensive strategy — and to making hard choices when necessary — then they should expect to see meaningful improvements over time. Hess, R. (2018, October 9). What exactly is teacher professionalism, anyway? EducationNext. Citation: Starr, J.P. (2018). 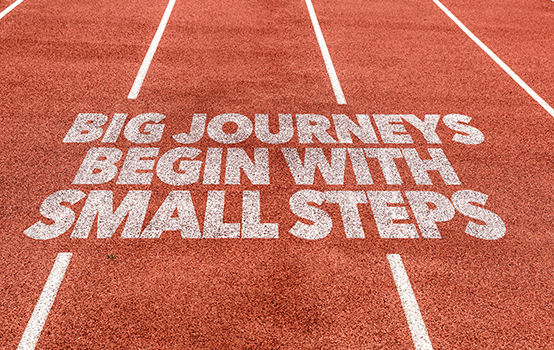 Leadership: Small steps, big changes. Phi Delta Kappan, 100 (4), 62-63. Can you elaborate this point? Should schools change based upon feedback from families? Or should families just “understand what schools are doing to improve teaching and learning”? In short, what is the responsibility of system leaders to listen? Thanks for reading and commenting Nick! Schools shouldn’t necessarily change what they’re doing broadly, but they have an obligation to both engage parents/families in learning what the overall change will mean and what it means for their child in particular (and how the individual child’s needs will be met if there’s a concern). As per a previous column I wrote, most parents are silent and reasonable and want an explanation about how changes will affect them. System leaders need to spend most of their time listening and asking the right questions, as far as I’m concerned.